AE Arma-Elektropanc to do MEP works on Dubai’s Wow Hotel and Hotel Apartments. 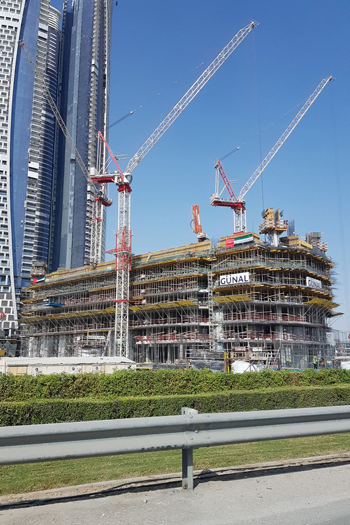 On completion, the $52-million Wow Hotel and Hotel Apartments project will stand tall at 336 m atBusiness Bay, featuring 80 floors. The luxury development will house 946 units with views of Burj Khalifa, hotel suites and rental apartments. The hotel suites, restaurants, pools and apartments are located on the 58th and 74th floors, the highest section of the hotel, with breathtaking views, says AE Arma-Elektropanc. An eco-friendly tower with a 184,778-sq-m construction area, Wow Hotel and Hotel Apartments will offer smart housing solutions and aim to install low-, medium- and high-voltage systems and generator systems besides key lighting and intelligent building automation systems. The other major facilities include climate control, fire detection, fire protection and extinguishing systems. Work on the project began in October and is due for completion by the end of 2019, says the Turkish group. It includes construction of a hotel apartments building comprising five basement levels, a ground floor, three mechanical floors, 68 additional floors and a rooftop. Wow Hotel and Hotel Apartments will be one of the most important accommodation and entertainment centres in the region, says a top official. “By taking part in major projects such as Wow Hotel and Hotel Apartments, we are trying to represent our country in the best possible way in the global arena,” remarks Burak Kızılhan, the chief executive of AE Arma-Elektropanc.